with your invoice will be sent to Rabbit Wranglers as a donation. I have been rescuing rats and other small pets since 2011.
find loving forever homes plus get them healthy and socialized. 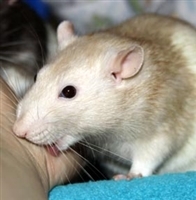 For The Love Of Rats Rescue also believes in educating the public on proper care for exotic pets. May not be combined with any other offers, specials, coupons, etc. No bulk parts. with your invoice will be sent to For The Love Of Rats Rescue as a donation. Mickaboo <http://www.mickaboo.org/about-us> is based in the greater San Francisco Bay Area and is an all-volunteer virtual organization, meaning we are a network of volunteers with no central physical location. Our basic goal is to rescue parrots and other commonly domesticated companion birds <http://www.mickaboo.org/see-our-birds> who have been neglected, abused, injured or surrendered to us because their owners can no longer care for them. F5RS is a group of caring individuals dedicated to improving the lives of the animals we bring in and finding them suitable homes and loving companions. We are based out of Youngstown, Ohio and are eager to do all we can to ensure the healthy happy lives of our animals. The Center for Avian Adoption, Rescue and Education, or CAARE, is an all-volunteer, North Dakota, 501(c)(3) non-profit, parrot shelter in West Fargo, North Dakota. CAARE is devoted to the welfare of companion parrots. Rhode Island Parrot Rescue, formerly Lazicki's Bird House and Rescue, is an all volunteer 501(c)(3) organization dedicated to the intake rehabilitation of unwanted, abused or abandoned parrots. 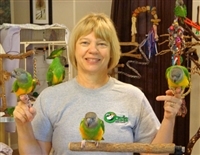 Our mission is to educate people on the proper care of parrots and parrot-like birds, their specific physical and psychological needs, rescuing companion parrots from harmful or unwanted situations and rehabilitating, when necessary, unwanted, found, or injured naturalized (free-flying) parrots; and offering these birds to qualified homes for adoption. Free Flight is an exotic bird sanctuary dedicated to helping both parrots and people through the celebration of the human-animal bond. Our mission is to maintain a sanctuary that shelters, nurtures, and re-socializes parrots while educating the public to inspire a lasting concern for the well-being of exotic birds. Free Flight is open daily for public visitation and features many educational programs and volunteer opportunities, in addition to our relinquishment, re-socialization and adoption programs for the birds.